The speaker shown in this video is a Cardratings employee. Her opinions are her own. Chase is a Cardratings advertiser and may compensate Cardratings. The Ink Business Preferred℠ Credit Card is subject to terms and limitations, which can be found here. The Ink Business Preferred℠ Credit Card is recognized among our 2019 Editor's Choice picks for Best Small Business Credit Card, and for good reason. Though this card has a modest annual fee of $95, the signup bonus alone well makes up for this small expense, as does its quick points earning potential and impressive redemption offers. All elements that should make business owners – even small business owners or those who are self-employed – stand up and take notice. After spending $5,000 on the card in the first three months of opening the account, new cardholders receive 80,000 bonus points. That's in addition to three points for every $1 spent on travel and other select purchases (more on those below) and one point for every $1 spent on everything else. Points can then be exchanged for cash transfers, gift cards or, for 25 percent more value, can be redeemed towards airfare, hotels, car rentals and cruises. Put in perspective, 80,000 Ultimate Rewards® points are worth up to $1,000 in travel, or $800 in cash. Alternatively, points can be transferred to participating travel programs at a full one-to-one value, meaning one Chase Ultimate Rewards® point equals one partner point or mile. This card offers plenty of bang for a modest annual fee, including cell phone insurance for the primary phone number as well as employee phones on the same account. It was recognized among our 2019 Editor's Choice picks for Best Small Business Credit Cards. Three points per $1 spent is available in select business categories ranging from the traditional – travel and shipping – to the more unique – advertising with social media and search engine sites (up to $150,000 spent annually). Redeem points for travel through Chase Ultimate Rewards® and they're worth 25 percent more. If the bonus cash-back categories don't really fit your business needs, or you spend above the $150k threshold annually, you may want to look elsewhere for maximum cash back. The most eye-popping thing about this card is the generous signup bonus, but choosing a card based on the intro bonus alone usually isn't a great idea; good thing the Ink Business Preferred℠ Credit Card also comes with quality cardholder perks and point-earning ease. 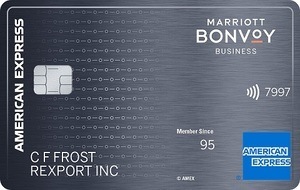 This card is great for business owners and frequent travelers as cardholders have the opportunity to earn three points for each $1 spent on up to $150,000 spent annually on travel expenses; shipping costs; Internet, cable, and phone services; and advertising purchases made with social media sites and search engines. After the $150k cap, and on all other purchases, cardholders earn one point per $1. Better still, employee cards can be distributed at no additional cost with the option to set individual spending limits, helping you to earn rewards even faster and keep track of your business' spending. As far as perks go, business owners are sure to appreciate the included cell phone insurance - a truly unique feature that Chase included with its new card after hearing from customers that it was desired. The perk provides up to $600 per claim in cell phone protection against covered theft or damage for all phones listed on the monthly cell phone bill paid with the Ink Business Preferred℠ Credit Card. In addition to the specific cell phone coverage, cardholders also enjoy a number of other protection services such as purchase, extended warranty, price, and return protection plans. Similarly, travelers can also rest easy knowing that the Ink Business Preferred℠ Credit Card protects them with trip cancellation and trip interruption insurance, as well as trip delay reimbursements and auto rental collision damage waivers. If the bonus cash back categories don't really fit your business needs, or if you spend more than $150,000 annually in those categories, the Ink Business Preferred℠ Credit Card might not be the best option if you're looking to maximize your rewards. Those looking to make the most of their point earnings might fare better with a card with unlimited, flat-rate cash-back potential, such as Capital One® Spark® Cash for Business, compared below. Earn 3 points per $1 on the first $150,000 spent in combined purchases on travel, shipping purchases, Internet, cable and phone services, advertising purchases made with social media sites and search engines each account anniversary year. Earn 1 point per $1 on all other purchases-with no limit to the amount you can earn. Earn 80,000 bonus points after you spend $5,000 on purchases in the first 3 months from account opening. Similar to the Ink Business Preferred℠ Credit Card, Capital One® Spark® Cash for Business allows for employee cards at no additional cost, but unlike the Chase card, there is no limit on how much users can spend before premium earnings stop. Instead, the Capital One card offers unlimited 2 percent cash back on all purchases with no caps or categories to limit purchasing. Additionally, those looking for a nice welcome offer might enjoy the cash bonus: Earn a one-time $500 cash bonus when you spend $4,500 in the first three months of opening a Capital One® Spark® Cash for Business account. Also, frequent travelers are sure to enjoy similar travelers' perks like those offered by Chase, such as purchase security and extended protection plans, travel and emergency assistance services, and auto rental collision damage waivers. The annual fee for these cards is the same at $95, though that fee is waived for the first year with the Capital One® Spark® Cash for Business card. For those who like the three-point earnings rate offered with the Ink Business Preferred℠ Credit Card, the U.S. Bank Business Edge™ Cash Rewards World Elite™ MasterCard®U.S. Bank Business Edge™ Cash Rewards World Elite™ MasterCard® might be a second option worth considering. Not only can new U.S. Bank Business Edge™ Cash Rewards World Elite™ MasterCard®U.S. Bank Business Edge™ Cash Rewards World Elite™ MasterCard® members earn a bonus of $150 after spending $500 with the card within the first 90 days of opening an account, but card users also have the opportunity to earn 3 percent cash back on cellular, gas and office supply purchases as well as 1 percent cash back on all other purchases, with no cap on total rewards. Furthermore, users of this card enjoy no annual fees and a 25 percent cash-back rewards bonus up to $250 each year. The U.S. Bank Business Edge™ Cash Rewards World Elite™ MasterCard®U.S. Bank Business Edge™ Cash Rewards World Elite™ MasterCard®, however, might not be the best option for frequent travelers as it does not offer the same extensive travel protection services as the Ink Business Preferred℠ Credit Card and the Capital One® Spark® Cash for Business credit card. The Bank of America® Business Advantage Cash Rewards Mastercard® credit card is another tiered rewards business card with which cardholders can earn 3% at gas stations (default), office supply stores, on travel, TV/telecom and wireless, computer services or business consulting; 2% cash back on dining (for the first $50,000 in combined choice category/dining purchases each calendar year, 1% thereafter); and 1% cash back on all other purchases. All that earning potential and no annual fee. What might be particularly appealing about the Bank of America® Business Advantage Cash Rewards Mastercard® credit card is that the intro offer of nine billing cycles interest-free on purchases (then, 14.49% - 24.49% Variable APR on purchases); that could certainly come in handy for new business owners with some start-up costs or even established businesses that have a major purchase on the near horizon. Plus, new cardholders can earn a $300 statement credit after spending $3,000 in purchases on your card in the first 90 days. Do keep in mind that you'll pay a foreign transaction fee of 3% of the U.S. dollar amount of each transaction you make while abroad, so the Ink Business Preferred℠ Credit Card is likely a better choice if your work often takes you overseas. 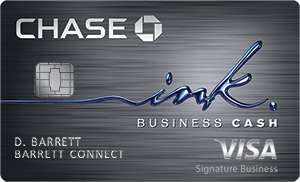 Who Should Get the Ink Business Preferred℠ Credit Card? If you like large signup bonuses and plan to make a fair amount of purchases in the bonus categories while staying under the $150,000 annual cap, then the Ink Business Preferred℠ Credit Card could be a great fit for you. Thanks to a great signup incentive, quality purchase protection plans and travel perks, points-earning ease and a low annual fee, the Ink Business Preferred℠ Credit Card makes a solid option for business owners and the self-employed alike. 6x points at participating Marriott Bonvoy hotels. 4x points at U.S. restaurants, at U.S. gas stations, on wireless telephone services purchased directly from U.S. service providers and on U.S. purchases for shipping. 2x points on all other eligible purchases.